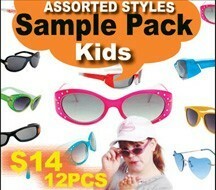 Buying sample packs are a great way to see the quality and test them out first before buying in larger quantities. Sometimes you may not want to buy all one dozen in a style so sample packs work great for refilling sunglass racks or locations that don't need large quantities. We are sure you will like our quality and styles. If you are wanting to buy larger quantities of sunglasses you may be interested in the Wholesale Sunglass Starter Packs we have here. 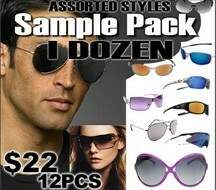 1 Dozen Assorted Sunglasses In Assorted Colors.